Located at an altitude of 3,500 meters above sea level is a renowned Buddhist monastery known a Kardang. 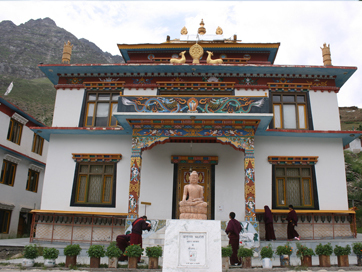 This important gompa is situated in the Lahaul valley in the Lahaul-Spiti district. In addition, this monastery lies on southern bank of the Bhaga River facing a town known as Keylong. Furthermore, this gompa was first constructed around the 12th century, and it was eventually in the 20th century that this monastery was renovated by two lamas due to the fact that it was damaged. This monastery built in the 12th century typically uses an architecture style commonly used in the Lahaul and Spiti district. It also consists of a small stupa dedicated to the founder of this gompa called “Lama Norbu”. In addition, this monastery also comprises of a library filled with Buddhist texts and scriptures as well as weapons belonging to the 12th and 13th centuries. Furthermore, this beautiful and important monastery consists of idols belonging to Tagden Shakyashree, Thara Devi, and Padmasambhava. As for religious significance or legends this monastery has none attached to it.